Poor scheduling by the CCA. Without my Tivo, I may have never seen the inaugural Canadian Womens Curling Championship by Rachel Homan. By pushing more games to Friday and play-offs later into the weekend, a night time final was scheduled against The 85th Academy Awards, the most watched televised event by baby boomer females who like movies and looking at fashion (or roughly 43% of the Scotties TV audience). I learned long ago, back in the days of VHS, that the Oscars are an event best recorded and viewed on delay, so that lengthy montages and interpretive dance segments (remember 2010? ), can be set to fast forward. 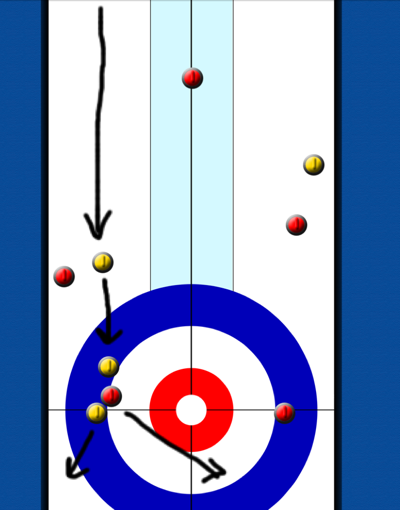 Of course, I record curling for much the same reasons. Jennifer Lawrence is 22 years old and is being lawded as the next Meryl Streep. Her performace in Silver Linings Playbook is great, in Winters Bone she's even better, but her finest might be in the press room after she accepted her award for Best Actress. Either her publicist is on sick leave or she fired him and hired a relative instead. Next thing we know she might be jumping on a couch. Rachel Homan is 23 years old and like J-Law, it looks like everyone else better get used to second place. I liked the Team Homan chances coming into this event (I even placed a small wager on them to win it all). I also felt that they might stumble, because breaking through the first time is perhaps the hardest championship to get. Or perhaps almost as hard as when you get really old, lose a step, and then have to pull out the grizzled-old-weary-veteran win that no one believes could happen. Tends to take place more in the movies, except when deer spray is involved. Team Ontario looked stoic and composed early, faltered in the middle, recovered near the end and then pulled out a win in the finals that, for a shot or two, may have had them waiting another year to rise to the top of Canadian Womens Curling. The final game was not the type we've expected. After a 3 point lead, you would figure this hit-like-mens-teams team would steadily break down the Jones resolve and quietly put them away. Instead Manitoba battled back to a tie game, only to surrender a second three-pointer and, after a steal of two in the 8th end, the ballgame. I'm not certain if the Jones rink kept playing to the bitter end because of TV requirements or to see if the pressure might get to the young Ontario squad. Five down with 2 to play and 3 down without hammer and one end was perhaps a little too much to expect for a historical comeback (0.2% and 0.3% respectively). Yes, it's still early in the end and you have a two point lead, but you could stay aggressive here and place a centre guard. That red rock in the twelve foot may come back to haunt you, but I'd rather play for a steal or force by controlling the middle of the sheet, than throw a rock that opens up a future possible runback on a rock that may not matter. I thought at first they were throwing the double runback, a shot that has a positive result and may have some merit. 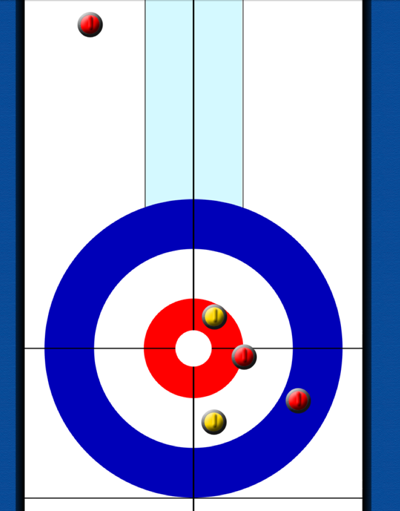 Jill then makes another bad shot that gets a good result, ticking off both yellow stones and staying in the rings, buried for third shot behind the corner and what is now Manitoba's fourth rock (Jill's previous shot). Team Canada third Beth Iskiw then makes a fantastic run back on the yellow corner, removing both Manitoba rocks, rolling to the middle, and making my previous analysis seem foolish. Eventually, Heather is a little heavy on a guard attempt, Jones is able to make a double and roll to sit shot buried, eventually scoring two to tie things up. Beth makes it perfect but the danger of this call (and the result makes hindsight rather easy) is clogging up the middle of the sheet and leaving the red stone squeezed between two rocks. Another option would have been to have Beth hit the yellow in the top twelve, with enough weight to move the stones around (or possible enough to clear them away and possibly catch the raised stone onto the two reds in the back twelve behind the corner). Difficult to see the danger lurking and certainly the other shot has a high level of difficulty, but this is a critical end in which you do not want the opposition to steal. The 9th end is the best time to be up one without the hammer, and as a result a steal puts you one down with (the worst time to be in that position). A deuce is important but avoiding a steal is more crucial. Granted, it still doesn't appear at this stage Canada is in too much trouble. After Lawes comes light on her draw, it looks even better. Beth attempts a tap on her last shot, and pushes the rock to the open, leaving Manitoba an opening. They also could have tried an out-turn draw, but either call seems fine. The issue is still the red stone locked in as second shot at the back of the button. It will be difficult for Canada to score two without getting it dislodged. Jennifer draws in front of the tapped stone, now biting a piece of button, sitting second and third. Heather attempts a freeze on her own stone with her first shot but comes a little heavy, rolling open in the process and leaving Jones with a double which she makes, and now sits one, possibly two. Heather is left with a difficult shot through a hole to take one and rubs the questionable stone, moving it to second, and Manitoba steals two. Difficult to rebound from being up two to down two in two ends but Canada appears to have a chance in nine to tie it. On her last however, Jennifer is able to blast three rocks and sit first and second when the dust settles, forcing Heather to a single. One up with hammer, Jennifer wins it in the tenth and its a rematch of the 1-2 game. First shot by Ontario, tick the Manitoba centre guard over to a corner and roll in the rings. Why don't more teams play this shot? The three by Ontario started innocent enough. On Ontario third Emma Miskew's last they are facing a Manitoba corner guard with a Manitoba stone buried back eight foot. Jennifer simply misses both her shots, most importantly being heavy on her first, and Ontario takes a quick 3-0 lead. Fourth end, now 3-1 Ontario with hammer and a missed attempt at the tick results in two Manitoba guards, long and short. I applaud their effort, many womens teams would not attempt this type of shot at this stage. However, I'm not sure what they are trying to accomplish. I suppose they may hope to save the promoted rock and the one in the top tweleve foot, and keep them both buried, but it is unlikely either will be shot stone (assuming that result is even possible). I may have chosen to come around the centre guard at this late stage. There is also a possible draw tap on their own stone, trying to move rocks around and possibly sit shot in front of a red catcher, but it is difficult. The result can't be analyzed however as the Ontario rink burns the running stone just before it hits the guard (in fact it was lead Lisa Weagle's broom jamming against the guard and ricocheting back onto the shooter that caused the burn,). After some discussion the rocks are returned and Jennifer attempts a draw around the centre to sit three. In shooting percentage, Emma gets dinged for the shot as a miss and ends up with 81% instead 86%. I've always felt a burnt rock should be treated as a non-shot, like getting hit by a pitch in baseball not counting as an at-bat. Rachel makes perhaps the unsung shot of the game by drawing to the back button against four and counting a key single, by an inch. It's possibly the shot of the game. 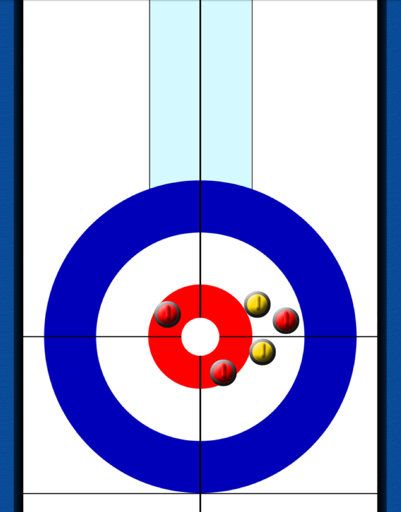 Manitoba has to sit on top of the red perfectly, leaving their other stone at the side and the yellow shot stone as catchers. 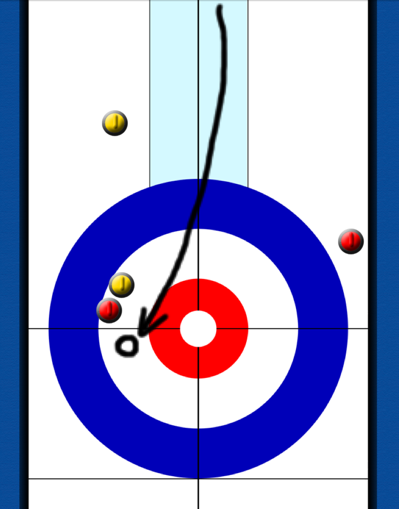 Unfortunately for Jones, the rock overcurls slightly and rolls too far, almost directly behind the yellow in the top eight. I can't see many other options for Jones here. 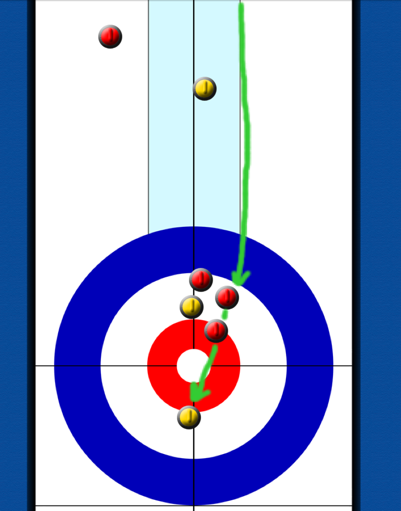 It is a difficult shot but, if made, could force Homan to one or possible set up a steal. It seemed unlikely Jennifer could draw around the guard and get shot rock, but they may have had another option. They could try and hit the top yellow, catch the shot yellow stone on the way through and move those stones around, possibly setting up something for her last shot. If that happens and if Rachel hits the resulting Manitoba stone top eight, in front of the four foot, she could sit first and third, leaving Jennifer a chance out of the end. After Manitoba rolls under the yellow, it appeared the immediate call was a run back or tap. Rachel instead chooses to play a very thin double, having to get by her rock in the top eight. She makes it perfectly (ok, maybe this is the new "shot of the game"), and Jones is left with a double and maybe roll behind cover. Her hit (in the exact same line) instead overcurls and leaves Ontario a draw for three. Playing aggressive in the 8th end, Jones is unable to place the rocks in good spots, misses her last and the steal of two makes this one all but over. I could comment on the final two ends but in truth, I was watching Edgar Winter's speach after tieing for the Oscar for Sound Editing. Next up...Live, from Edmonton, The Brier. 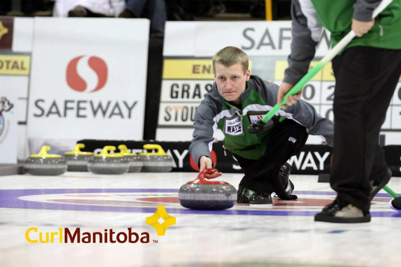 Our Brier guests continue with Jon Mead from Team Manitoba. Jon sits down to discuss his time with Wayne Middaugh, share somes stories from his time with some skips, the Scotties, expectations at the Brier and playing at home for the Olypics Trials. The whole crew is back and joined by their first Bluenoser, Paul Flemming. The panel discusses the state of Curling in the East Coast of Canada, the upcoming Brier, and looks back to some of Paul's earlier triumphs and near misses. In case you missed it, last weekend was stocked full of televised curling. Rogers SportsNet had cameras and crews across 4 provinces and did a great job of broadcasting several Mens Provincial page/semis and finals. I did have trouble setting my Tivo and PVRs based on the confusing guide. The listings didn't seem to match the actual times I knew the games were taking place and why was the Ontario semi-final scheduled for 30 minutes from 7:30-8:00 AM?. Why were Koe and Martin playing the Alberta 'Womens" Finals? I recorded the Dominion Tankard finals from Ontario only to find another recording of the Manitoba finals. Sorry, but no CWM comments on that game, since I haven't been able to find a replay online. And another beef with Rogers, either move your camera angle or stop putting the score across the bottom of the screen and having it cover up part of the rings. I can't see where all the rocks are! No slight to other provinces, but BC, Ontario and Manitoba turned out to be undercards to the Alberta Main Event. 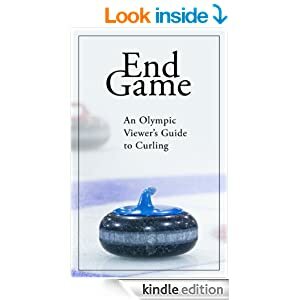 The McEwen/Stoughton final never materialized as curling author Sean Grassie upset Jeff in the 1-2 game, only to fall short in the rematch the following day. Purple Heart number 10 for Jeff Stoughton. When I was growing up in Manitoba, 4 or 5 seemed like the most any skip might be able to reach (Burtnyk has 5, Ken Watson 4 and 4 others with 3). After a time out, Stoughton calls for the guard which I agree is the correct call. Unfortuantely Jon's rock comes well light. Not sure if it picked or as announcer back-from-retirement Ray Turnbull mentions he "pulled the string", which as a curling phrase I've never understood nor found the historical reference. Searching the web you find the reference to an off-speed pitch in baseball. A note about Sean Grassie, not only does he hold the Bronze from the 2009 World Mixed Doubles (that's right, Mixed Doubles goes back to the last decade), but it's the only medal Canada has from this event since its inception. It was also played in the land of the Hobbits. Grassie actually catches a break when the double attempt on the yellow is inside and comes across the face, the top yellow stone actually jams the red in the four foot on the one in the twelve, and still manages to remove the back yellow. Grassie lies two, spread across the house. Jeff misses the double attempt on his first but manages to roll across the house, push the red stone back and remain shot. 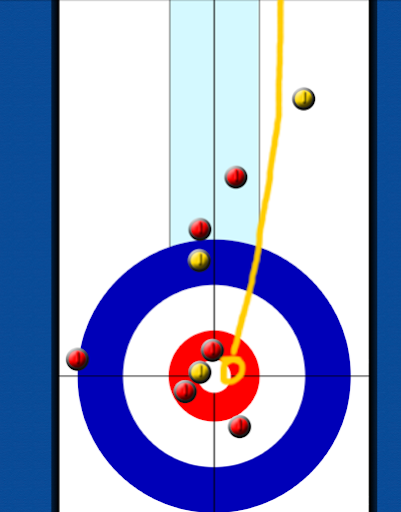 Grassie chooses (wisely) to tap freeze on the Stoughton shot, to sit two. Jeff now has to try and freeze on the back red, hoping to be tucked behind, and he makes a great shot. Unfortunately for Jeff, the rocks are aligned so that Sean can hit and roll off his own stone, which will then hit another stone and also roll in for the winning point. Not an easy shot but Sean has no trouble and completes the upset. A game that was uneven most of the time, but an earned victory. I will not discuss this any further than to repeat what Mike said at one point of the game, "I might as well be sitting on the bench". After demolishing Fowler in the 3-4, Mike comes up with a poor game and Team Stoughton is sharper than the night before. The final score was 5-3 but it never really felt that close. First end jitters and Sean throws his draw through the rings. All he needed was a bite of the eight or at least half of the twelve foot to hold Stoughton to one. Instead, a steal of two and the loss of hammer from the 1-2 game is erased. Second end is another no-guard-in-site steal after another missed draw by Sean (though this one was much closer). 3 zip for Jeff. Game over? In the 3rd, draw weight was a mystery as Jeff was heavy, Sean was light, Jeff was heavy and a bounceback deuce for Grassie. Meanwhile, 24 year old Kody Janzen is not only a steller young player, he sports a throwback lid that could have him playing in the 50s with a heavily patched sweater and he wouldn't be out of place. One of these four is not like the others. Can you spot the difference? Or maybe Kody could have played with Ray back in '58. Score at 5-3 and Jeff avoids a deuce with a nice double take-out on his last shot. Blank, and they head to the eight end. Grassie gets in a heap of trouble in the 4th end. Jon Mead misses a run back and instead removes his own but a gift from Grassie's third Corey Chambers when he misses the double, jams on his own rock and allows Stoughton to draw to sit three. Sean, facing 3 on his last, makes a great hit and roll to sit in front of shot stone at the back eight. Jeff's hit appears to pick and instead of a deuce he is held to one. Watching Jon Mead's second shot in the 9th, I hear Richard Hart commentating on the Alberta final (but video is still Manitoba). Is this Shaw broadcasting or SportsNet? Sean leaves his last guard out to the side to prevent Jeff from making a thin hit for one. Clearly a mistake as it appeared he could have guarded that and the double for two that Jeff was able to make for a 3 up lead heading to the last. BC Final - I admit it, I didn't watch this. I was much too spent after a day of curling and the shear brilliance of the Alberta Final. Perhaps I'll find some time in the coming days or weeks, but for those who need a recap...Bilesky 7, Pierce 4. We can only hope that we get 1 or 2 games in the Brier that can match this one for shotmaking and for tension. First End I don't completely agree with Martin's first call. Lead for Koe, Nolan Thiessen, puts his first rock just biting top eight foot. Martin choses to hit it, playing the end out as a blank, unless a mistake by Koe allows him to put up a corner guard (and even then he may not). Back to the discussion of having hammer in the even ends. I need to get the numbers from Gerry at CurlingZone but I'd like to know in a 10 end game how often a team that has hammer in the 2nd, ends up with hammer in the 8th end. My reason for throwing a corner has less to do with "even ends" and more to do with the placement of Nolan's rock. If Martin puts up a corner, Koe has to decided if he wants to guard a rock biting the eight foot or if he wants to play a tap back. If he throws a guard, Martin can come around both stones and put the pressure on. If he throws a tap back, Martin can play a double or hit and roll and will have a chance to use the corner guard. Having said all that, it's the first end and this call isn't going to win or lose the game. I think of it as an opportunity missed. In the Fifth End, Koe has a hit and roll opportunity on his first but isn't able to move the Martin stone kissing his own off the button. Martin throws a guard and Koe could have chose a raise onto his red stone but the risk of a steal (of at least one, possible two) existed and a deuce seemed unlikely. Koe instead decides to throw his last away. Koe is Red and wisely choses not to play this shot. Score is tied 2-2 at the break and Team Koe is at 92% and Team Martin at 86% (including a full miss by John Morris). Rogers shows a stat of Koe and Martin's records in 2012/13 Season. The stat of 1-PT (point) games is missleading to me. Koe is 16-7 and Martin is 6-7. The sample size in a single season is small and many times a close game ends with a score of more than 1 point difference, and other times a 1-point game is not as close as it appears. I'd like to see record in games that are tied or one down with hammer and 3 ends remain (after the 7th end in a 10 end game and 5th end in an 8 end game). This is the point at which teams are entering the "End Game". Koe cannot be liking the set-up. 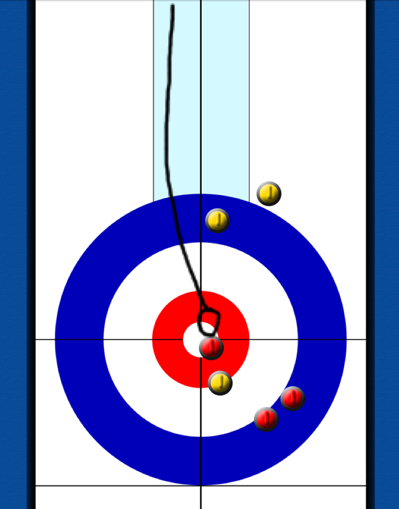 Martin sits 2,3 and 4 and Koe's shot stone has no catcher behind it. There is considerable discussion on what to call and what leave is the most difficult shot for Kevin Martin. They look at drawing in on top of Martin's rock top button. A possible hit and roll off the 4th shot in the top eight foot. Eventually they settle on guarding the inturn, taking away the raise on the yellow onto the red for two or possibly more. Martin is left with two likely options: straight back raise on the red stone just out of the rings (black line) or his eventual choice, the angle raise on the yellow corner guard (green line). It appeared this was the more difficult shot to make but it had more potential outcomes that would generate points. If Kevin is able to raise the stone and hit his rock in the top four foot, it's very likely he will move the back red stone. 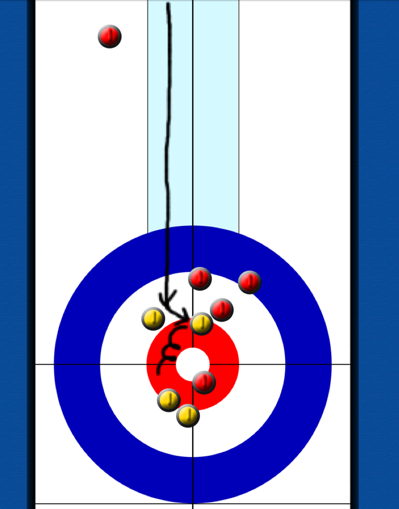 His room for error on the angle is small but the room for error if he is able to raise the rock onto the target stone is greater. The straight back raise on the red was clearly an easier shot to make, but there is less room for error. Running the red also brings in a slight possibility of a steal of two, though it would have to be a very poorly thrown shot and I expect it wasn't something Martin was concerned about. If I'm Kevin Koe, I prefer Martin throwing this shot over the straight back, but either way I'm holding my breath as I know this game could be over. Martin misses the angle raise and Koe steals one and goes up 3-2 heading into the 7th end. In the 7th, Koe puts up a tight centre guard on his first stone. He is expecting Martin will likely hit his open shot in the rings if he draws into the four foot. Koe rubs the yellow stone and rolls into the open, biting the four foot, but he is fortunate to push the Martin stone a fraction of an inch and into 3rd shot. One of Kevin's players appears to utter a word that in Saskatchewan, may have had him removed from the game. Kevin attempts a big weight hit to try and roll his shooter into the two stones and maybe score two, but he ultimately settles for a single point. 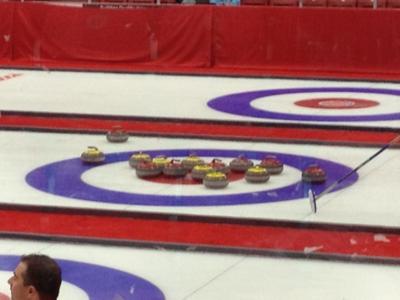 Eighth end, tie game, and Koe has hammer. Didn't Martin blank the first so he wouldn't be in this situation? On discussing Marc Kennedy's second shot with his skip, we get to hear John Morris say "tickle it" on TV. I've always wondered how folks unfamiliar with this game react to the array of words used in Curling. It is a sport that has its own language and does at times make the game more complex than it really is. Imagine yourself coming to Canada from a tropical island, never having seen snow much less curling. Now try to determine what each of these words mean: biter, keen, pebble, hack, pin, lid, draw, four/eight/twelve (as it refers to ring sizes), IE. "he had to draw the four to win", hammer, freeze, hog, hurry! (aren't you going as fast as you can? ), shot, peel, steal, and weight. I'm sure you can think of many others. 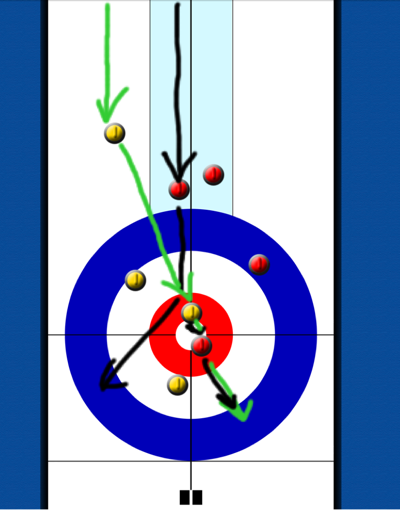 On Koe's first he is drawing around a long centre guard and comes up a fraction light, leaving Martin first and third. Koe's is buried in the top eight foot however and Martin's shot stone is wide open in the back eight foot. He attempts to come around the Koe rock into the four foot. Martin is unable to bury his rock and Koe has a difficult but make-able double to take two points. It's wide all the way and, worse than even being held to one, Koe gives up a steal (on a measurement) and Martin goes up 5-4. That shot resulted in the difference of Koe's chances dropping from 85% (with a deuce) or 63% (with a single) to 37%. 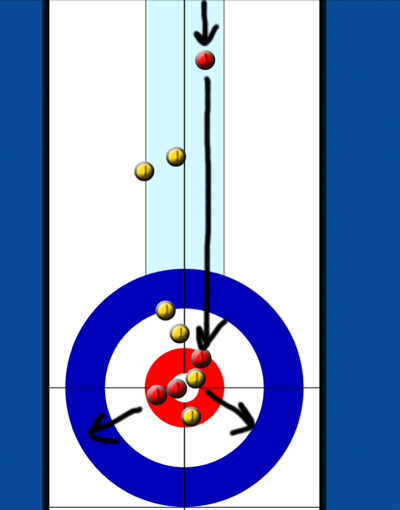 Koe had curled 98% at that point, and with one miss shifted the advantage and possibly the outcome to Martin. Ninth end, Morris hollers down before a Kennedy stone and this time calls Martin "Skippy". By combining "skippy" and "tickle it" in the same sentence, John may be on his way to writing a best selling childrens' book to go along with his curlers workout manual. Commentator Richard Hart prefers the soft hit on the two reds (green line above) rather than the peel of the centre guard, Koe's eventual call. 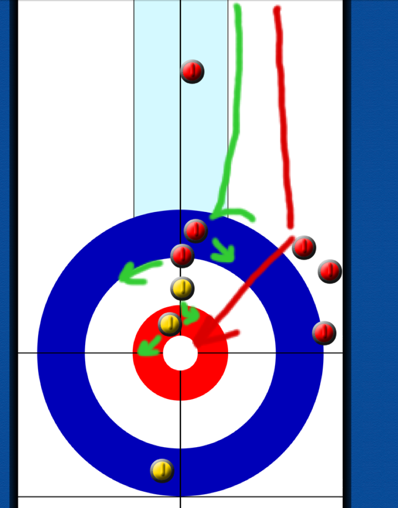 I agree with Richard that putting 4 red against a single yellow is a preferred position, but they would need to closely examine how the rocks would be left in order to best avoid a dangerous shot by Martin. Facing a time crunch the peel is the simpler decision to make. It would have been better if they had made that decision sooner and saved the time out for later. Martin now has to make a decision of where to put his first rock. He decides against the guard (recognizing if Koe makes the shot Richard described above he may have no shot on his last). He decides to try a chip his yellow on the top eight foot over with draw weight. John warns against the shooter going too far and leaving a hit and roll for Koe but Martin suggests he won't play that. I have no idea why he thinks that, suspect he may have been in denile. Koe decides to play a thin double and hope to spill the shooter in for second shot. If they had more time to examine (Koe throws his last with 10 seconds on the clock), they may have chosen to play less weight or picked a different spot to hit. 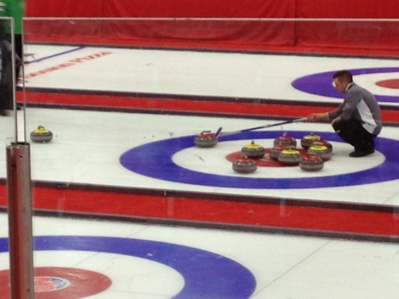 They were actually calling sweeping when they needed the rock to curl a little more. If the shot was even there (and it may not have been because of the top red) it's likely made once in 20 tries. 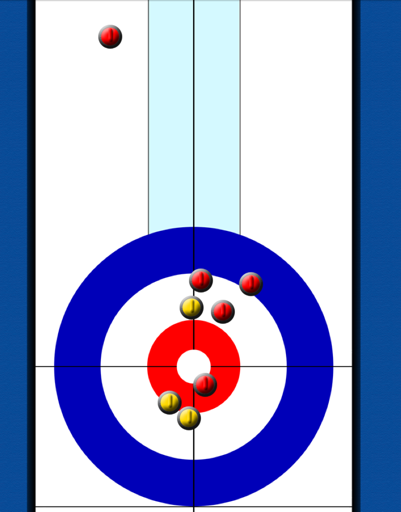 Martin lead Ben Hebert makes his ticks in the extra end and Kevin eventually hits an open Koe stone for the win. Their celebration isn't quite an Olympic Gold medal, but there are wide smiles, big hugs and despite having been here many times before, a genuine sense of joy. This team has not often been near its peak since 2010 and this is a game they very easily could have lost. This game made me consider that, as much as this Brier field looks great and it will be one to savour, those Trials in Winnipeg next year might just rival anything we've seen in curling. Four teams at their peak with a 5th (McEwen) an arguable equal. 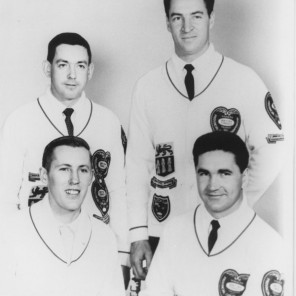 The last Trials was clearly Martin and Howard at their best, Stoughton a step behind, a part-time Middaugh squad, a declining Ferbey rink and a group of teams still improving. I was hoping for better odds on Homan (3 to 1) but I still dropped a little on her squad to win it all. I expect she's closer to 30% rather than 25% so it's a small advantage. PART 2 of the first LIVE recorded ATH with James Pahl and Mark Klinck. Fresh off their defeat in the Alberta Boston Pizza Cup, James and Mark share their recent and past curling highs and lows with Kevin. James talks about his Brier semi-final loss while playing with Kevin Martin in 1995, and shares stories about Hec Gervais and Paul Gowsell. PART 1 of the first LIVE recorded ATH with James Pahl and Mark Klinck. Fresh off their defeat in the Alberta Boston Pizza Cup, James and Mark share their recent and past curling highs and lows with Kevin. James talks about his Brier semi-final loss while playing with Kevin Martin in 1995, and shares stories about Hec Gervais and Paul Gowsell. The Future of Alberta Mens Curling is Thomas....and Sluchinski? Greetings from the Boston Pizza Cup in Leduc, Alberta. Yesterday I witnessed what may have been a glimpse of the future for Purple Hearts in the Wild Rose province. The "B-Side" finals, winner getting a Saturday night date with Kevin Martin in the 1-2 Page Play-off game, did not include defending champion Kevin Koe. It did not have Jamie King (with World Champs Blake MacDonald and Scott Pfieffer playing back-end). The game did have Charley Thomas, which is not a huge surprise given his junior pedigree (2006 and 07 Canadian champion) and the fact his team lost the finals last year, while skipped by Brock Virtue. What most everyone did not expect was the Sluchinski brothers to not only reach the B-Side finals, but to win and move on, dropping Charley to the "C-Side". Aaron (skip) and brother/third Justin Sluchinski had a great day Friday, but will also look back to Thursday and consider what might have been. 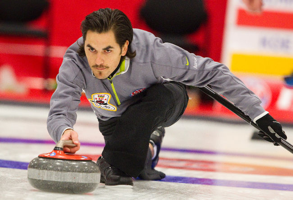 In the afternoon draw they were tied without hammer in the final end against James Pahl, and were ready to shake until Pahl's final draw came up just short. In the evening, the Sluchinski's fell early to Kurt Balderston, wiley veteran who may have more appearances at this event than Aaron or Justin have years on this planet. Balderston took a 5-1 lead into the 5th end, but Sluchinski responded with a "take-two-steal-two-steal-one" run that put them ahead 6-5, and, after a blank in the 8th, followed with steals in 9 and 10 for an 8-5 win. Friday's first game had Sluchinski dropping a quick 4 points on the Kevin Koe rink in the first end. I missed the early stages of the game but understand if not for Aaron coming a little deep on a draw in the fouth end, he could have stolen a few more points. At that stage, he held a 6-3 lead, with the hammer. Naturally, this is the stage of the game where you attempt to keep things simple, remove rocks and limit your opponents chance to come back. 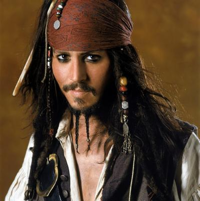 But these swashbuckling Sluchinski's had other ideas. Which one is a brooding actor who smokes cigarillos and lives in France? Kevin was unable to get his rocks positioned correctly and Sluchinksi headed to the 10th end with a 3 point lead. Suprisingly, Koe headed to the final end with only 2:11 left on his "thinking" time-clock. It never became and issue as Sluchinski pulled out a big victory. While this game took place, Charley Thomas was battling Jamie King. A couple of interesting calls which Charley made that we can take a look at. Rather than try a thin double for three, he chose instead the angled double and roll out for two. A deuce here puts Thomas at roughly 76% and a three would increase that to 89% likelyhood to win. At first I was surprised they didn't attempt a shot at three, but given the set-up, difficulty of the shot, and slight chance you could still make the double but rattle your own rocks to the side and not get three, it likely was the correct call. The advantage of the three is outweighed by the chance at only scoring 1 (60%) or even giving up a steal. The final decision comes down to the skip's assessment of his chance of succeeding with the shot. Naturally, in the 6th end, King scored three to go up one. Thomas bounced back with a deuce and a steal to go up two. In the 9th end, a decision on his last shot may have back fired for Charley. Thomas had a rock in the top eight foot on the centre line. 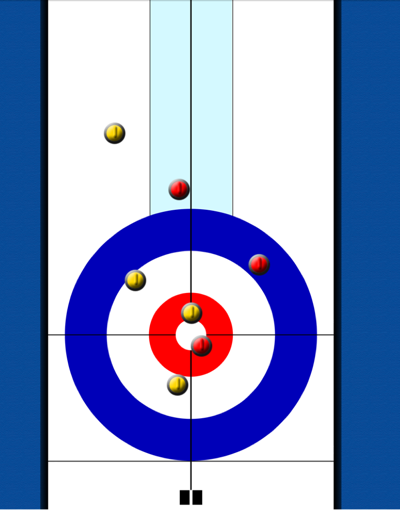 Fourth for King, Blake MacDonald, had just thrown a draw around that rock and sat in the back of the rings, I believe it was second shot. Thomas also had a biter sitting third and King one sitting fourth. Thomas chose to draw down and follow Blake's draw. He could have chosen a run back instead, and I would argue that was the preferred shot. 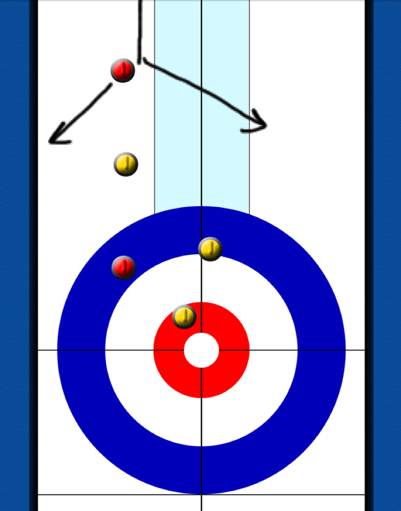 By drawing, if the rock is not perfectly frozen, Thomas leaves a possible double to give up a deuce and, as it turned out, Blake had a very possible chance at a triple to score three. Fortunate for Thomas, he missed it and ended up with a single. I suppose the fear on the run back was the biter that King had for fourth shot that could come into play. The rocks were less than 6 feet apart and the runback did not look very difficult. I suspect the Kevins (Koe and Martin) and others would have played the hit. The Friday night match-up of ex-junior champions proved to be more cautious. Charley (who I believe may moonlight as a commercial actor), kept the game close with usually less than 7 rocks in the four foot, but still an entertaining and well played contest. Sluchinski made a big angle raise early in the game to avoid a steal and then took a deuce in the 9th to take a 1 up lead into the final end, which he eventually won in an extra end. Today's afternoon match-up has Charley battling Bawal and King against Koe to determine who plays in the 3-4 game later tonight. Rogers SportsNet Covers The Globe - Part III, Where in the World is Port Hawkesbury? Of course Port Hawkesbury is in Nova Scotia (even I might have known that). Rumour has it the event was well attended and supported, just what we need for these events. Ice may have been a bit off (appeared draw weight was sometimes a mystery), leading to a higher than normal percentage of steals during the weekend games (or perhaps it was randomness). Jacobs catches a break in the 4th when Jeff makes a poor attempt at a double and actually misses so poorly they cross the face and roll away leaving a steal of one. Tied at 3-3 in the 6th end, Brad gives it right back and more with a missed draw resulting in a swing of 3 points (Stoughton steals 2) moving his odds to win from 63% to 15%. Thats why skips get all the glory, because the game can hinge on one or two of their shots in a game. The next one comes in the 7th when Brad rolls out on his first on an attempt to sit two. In the tenth end, Mark Nichols makes the two ticks and Jeff has an open draw to the four foot for the win. Skills with the tick shot gets stronger every year. I exect the percentage by top teams must be in the 80+% range (just speculating, I'm sure someone has this data). In Part I, I mentioned Jeff Stoughton hadn't won one of these Grand Slams in a while. Turns out, neither has 17 time winner Kevin Martin (at least by his standards). He hasn't won since 2010-11 Season, 3 years ago. There aren't any missing police reports of Mrs. Martin with a golf club coming after Kevin in his Cadillac Escalade, Thanksgiving 2011, right? Third end, Martin comes well short on a draw-tap. Fourth, John Morris gets an unfortunate wick on his own, rather than McEwen shot stone, where he would have been sitting two and in great shape. Kevin gets a break, but then is heavy on his soft hit and ends up forced to one. 5th end, great draw followed by great draw. McEwen gets one and its 4-2. 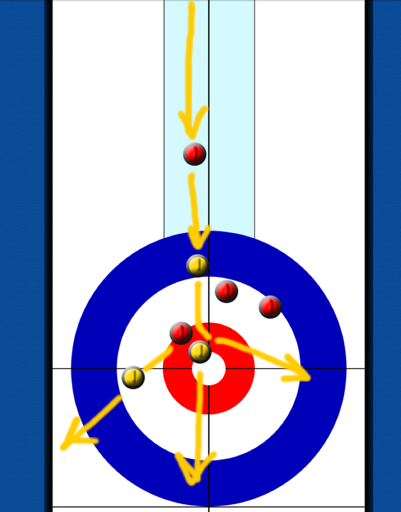 6th end looks like the old Procurl video game (or this online game). Everyone chasing to get their draw into the button. Not great when you have hammer and need more than 1. (Was every rock in play?) Mike makes the mistake on his first that he had foreshadowed, but Kevin makes a horrible follow up. Another great draw against 3 for Kevin, to stay in the game. 7th end, BJ looses all his yellow on a strange run back attempt and leaves Martin sitting four. See if you can follow my drawing..
Tough draw on Mike's last and he surrenders a steal of one. 4-4 heading to the last. 8th end, tied. A missed tick on leads first leads to an entertaining finish. Interesting call on Mike's last, choosing to attempt an angle hit versus a double, but he makes it. Mike McEwen's team threw something like 97% on their draws, played a fanstastic game, but still had to make a delicate shot for the win. That draw weight didn't follow them to the final however and Jeff Stoughton came away with victory in the finals. In the second end, up one without hammer, Mike is in some trouble after a great hit and roll by Stoughton's third Jon Mead. Luckily, the centre guard is one of McEwen's red rocks and he makes a raise take-out, but his promoted stone rolls out of play. Jeff makes a draw around Mike's off-centre guard, but only sits top eight foot. Rather than play the raise hit again, Mike instead decides to draw. Unfortunately the rock hangs out and the fails to finish fully buried, leaving a piece open and Jeff a soft hit for two. Correct call? The raise is likely made 80% of the time (Mike's chance may even be higher), but most likely the result will be a blank if he is succesful. I like this call because it brings the chance of a steal or a high probability of a force to one. If Mike knows the ice and the weight, it's the correct call. In the forth, Jeff attempts a hit and roll on his first but rolls too far. Mike has a good opportunity and makes a great draw, but about a foot too deep and allows Jeff a chance to freeze on top. Mike attempts a difficult draw-tap through a port but is held to one. Tied 2-2 after 4. The fifth end, a sloppy one, is the turning point of the game. Mike's team has chances early but, on what appeared to be a stratigth spot, they are unable to execute hits effectively on seconds last and thirds first. In fact, on third BJ Neufeld's first shot rather than make a double he kisses a Stoughton stone fully behind cover top eight with staggard rocks in front. On Jon Mead's first he actually misses by coming very deep, sitting third shot. BJ is light on his next and actually corner freezes his own, assisting Stoughton because a future raise is now not possible. Jon is fine with his next and now Mike faces two Stoughton rocks in the four foot and no raise option. McEwen is forced to attempt a desperate hit and roll (red line below) from the wings, never a rock you want your skip throwing on his first shot. I don't really like the call, by missing he left himself even less with his last shot. Having said that, there weren't many other options available. Possibly tapping BJs previous stone and trying to split the red rocks onto either side (green line below), in the open, may have been an option. Mike's shot is too thick (again it ran straight) and Jeff makes a draw to the four foot with his in turn. He comes a hair deeper than he wanted and there is still a chance for Mike to make a hit and roll into a small pocket and get out of this end. This time he misses the rock completely and Jeff is left with a draw for four. Game over. I am looking forward to a rematch of these two rinks in the upcoming Manitoba Provincials. Rogers will be there, and elsewhere, covering more curling than you've ever been able to watch in one year, all in one weekend. My intial thoughts were "is it too much curling on TV?" but I'm starting to come around to more is better.